Decades of geological data are being used to produce 3D computer models of what lies beneath the proposed sites for the Glasgow Commonwealth Games. The British Geological Survey (BGS) can draw on details gathered from 35,000 boreholes sunk in the city and records of old mine workings. The models can be viewed from any orientation and zoomed in on. A flavour of preliminary work will be on show during an open day at the BGS's offices in Edinburgh on 27 September. The survey's work in the fields of space weather, earthquakes and studies on the effects of the last Ice Age on Scotland will also be on show. The BGS is putting together detailed models of the 2014 Games host city in partnership with the Clyde Gateway Urban Regeneration Company, Glasgow City Council, South Lanarkshire Council and Scottish Enterprise. The BGS's Dr Diarmad Campbell said they would be a useful tool for guiding planning, development and where to sink new boreholes. Different colours represent layers of man-made ground, sand, gravel and coal seams. 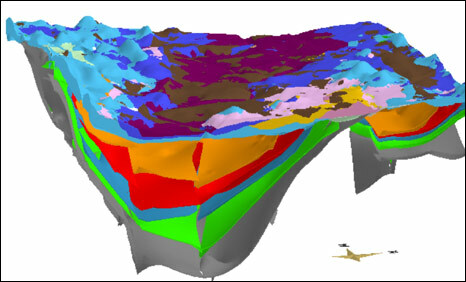 Dr Campbell said: "The model is very simple to use and can be turned around on the screen to view from any orientation and zoomed in on to see more detail." He said the models could be used to predict what may be found in a new borehole. "In effect the model can be broken up and seen from the inside," he added. The open day will involve input from Lochaber and North West Highlands geoparks representatives. Fossils found in Scotland will be on show, as well as the BGS's work in forecasting the effects of solar activity on Earth. Open day co-ordinator Ted Harris said another feature would be the survey's research of the Ice Age on Scotland, which is adding to the knowledge about glaciers in Greenland and Iceland.